ww2dbaseEdvard Beneš was born in Kožlany, Bohemia, at the time a province of Austria-Hungary. In 1912, he taught at the Charles University of Prague, and from 1916 to 1918 he was a Secretary of the Czechoslovak National Council in Paris and Minister of the Interior and of Foreign Affairs of the province. His political ideal saw the Czechs and Slovaks working together for a common Czechoslovakia, and with this vision he was a strong organizer of Czechoslovakians abroad. 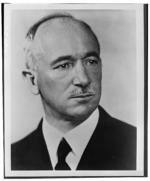 Between 1918 and 1935, he was the Foreign Minister of Czechoslovakia, and from 1920 to 1925 and again from 1929 to 1935 he was a member of the Parliament. Between 1935 and 1938, he was the President of Czechoslovakia, but resigned from office on 5 Oct 1938 as his personal protest against German aggression and western appeasement. Emigrating to Britain, immediately outside of London, he headed the Czechoslovakian government-in-exile as president. In Britain, he organized various movements against German occupation of his home country, one of which culminated in the assassination of Reinhard Heydrich. After the war ended, he returned to Czechoslovakia and resumed his role as the president of the nation, with a new policy to eventually deport ethnic Germans to Germany and Austria. On 7 Jun 1948, he resigned once again, this time due to the communist takeover several months before; Prime Minister Klement Gottwald, the head of the communist movement, succeeded him as the next president. Beneš died at his villa in Sezimovo Ústí, Czechoslovakia. 28 May 1884 Edvard Beneš was born. 18 Dec 1935 Edvard Beneš was elected as the President of Czechoslovakia. 5 Oct 1938 Edvard Beneš stepped down as the President of Czechoslovakia. 21 Jul 1940 Edvard Beneš established the Czechoslovakian government-in-exile in London, England, United Kingdom. 16 May 1945 Exiled Czechoslovakian President Eduard Beneš returned to Prague, Czechoslovakia to a rapturous welcome. 3 Sep 1948 Edvard Beneš passed away.